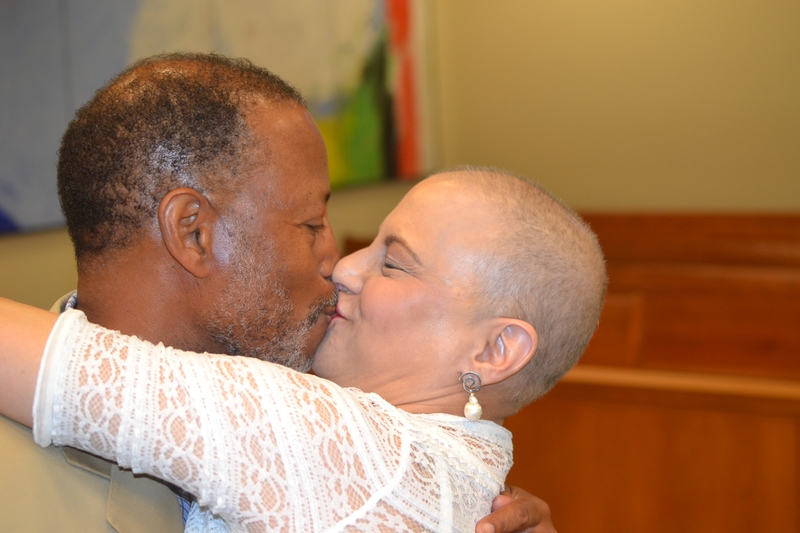 The last post was fresh out of surgery, which followed chemotherapy. The surgery results were very positive, with ‘clean margins’, which means they got all of the cancer from this one area, on the right breast. My cancer is still potentially ‘alive’ in my mammary lymph nodes, left and right, so we need radiation to do its magic on living cancer, as well as clean up dormant cancer in the radiation field. I started radiation on Thursday, October 2, which will occur every day, Monday through Friday, for 6 ½ weeks so I will finish around November 16th. The radiation field will be larger than what I expected, too, as it will cover my chest and right side out to the other lymph nodes under my arm and up to my collarbone. I’m already putting on cream to prevent a burning and skin discoloration. I’m a “complex” radiation patient since this is a 2nd pass and we need to avoid my heart, lungs, rib cage, etc. I just learned my heart is close to the center of my chest, which means I’ll need to hold my breast during radiation to separate the heart, preventing damage. Of course I have to be unique…I’m special, right? 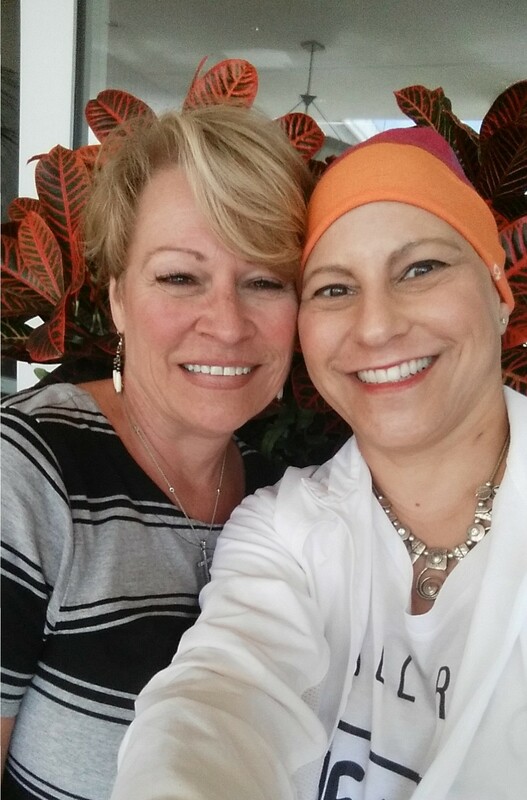 I’m in the best hands with my medical family at Virginia Mason Cancer Institute with angels at all levels, from check-in coordinators, nurses, technicians, schedulers and, of course, the best doctors in the country. 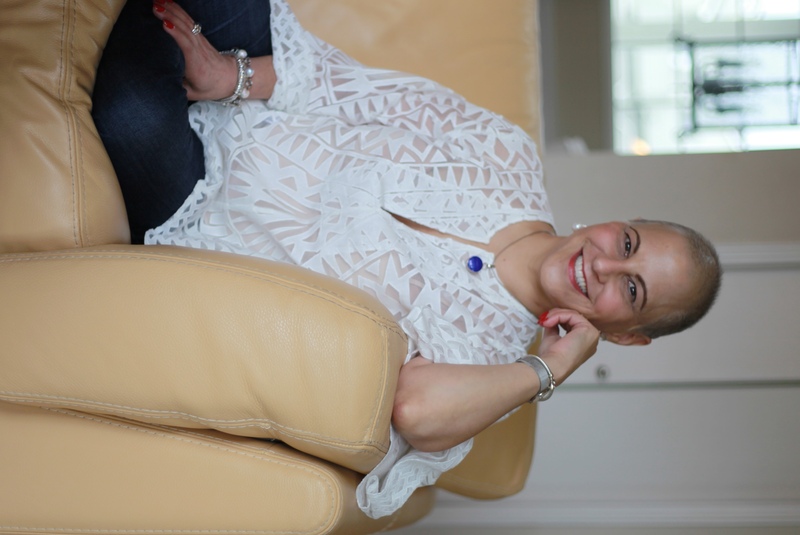 A. Keynote speaking – telling my story and inspiring donors and participants. 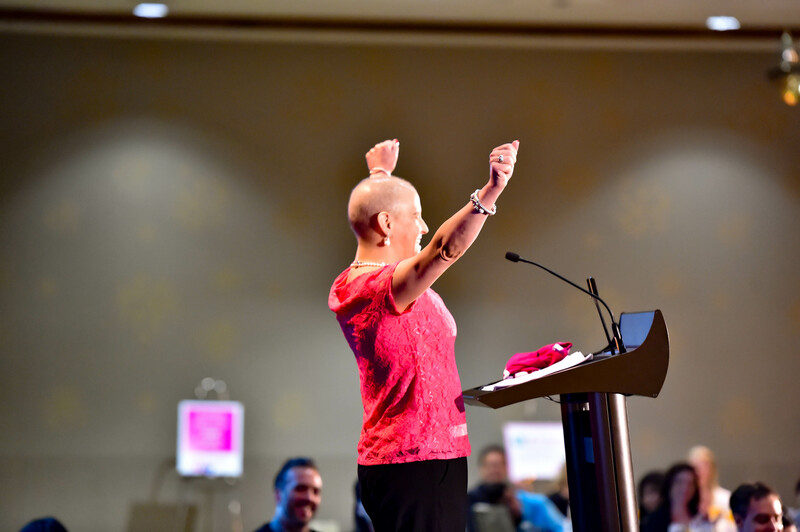 I spoke at the American Cancer Society’s kick-off breakfast on the same day as my LAST day of chemo – great celebration! 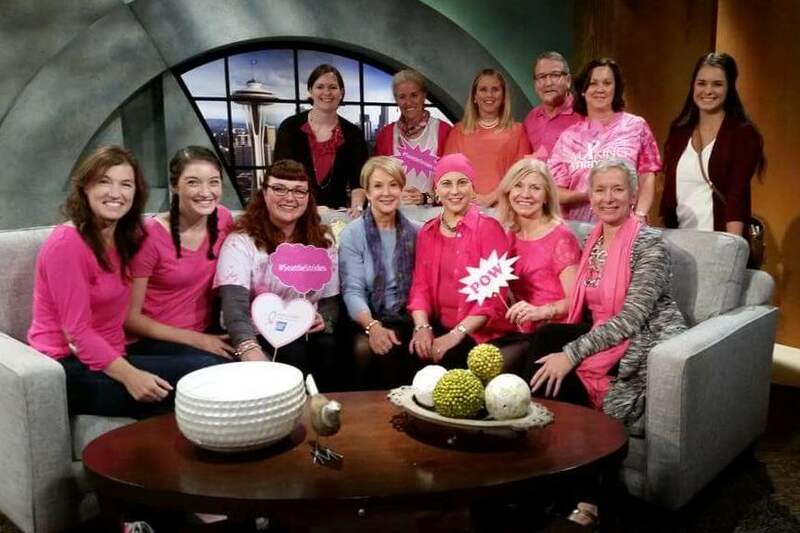 I was on our local “New Day Northwest” TV just 6 days after my surgery following chemo. See the segment clip here: http://kng5.tv/1FzHRvu. Friends and some American Cancer Society staff joined the taping and it was a great way to celebrate surgery recovery. C. Public Service Announcements – for Breast Cancer. I was asked to record 3 public service announcements for Northwest Cable News on 3 different topics: the NFL Crucial Catch, the October 10th Making Strides Against Breast Cancer event, and breast cancer screening. Let’s see who catches one of these running throughout the month of October. 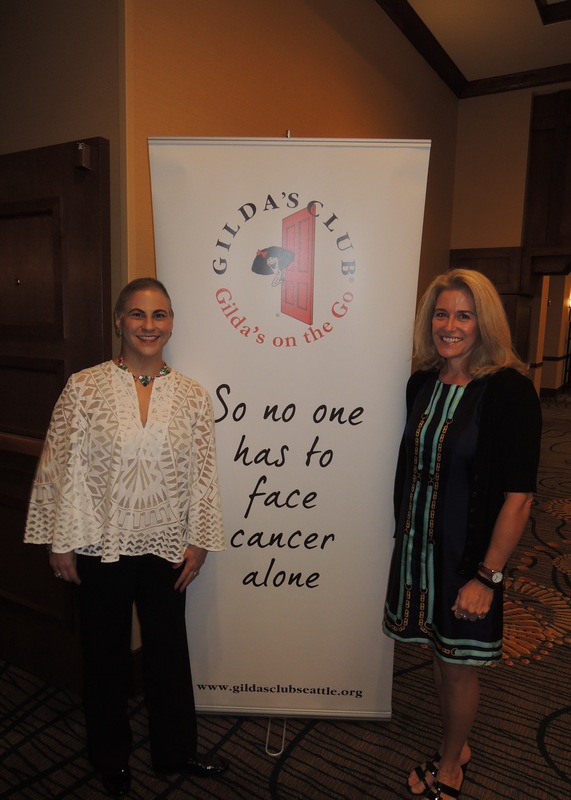 Thanks to my friend and committee chair, Tanya Button, I keynoted the breakfast fundraiser for the Gilda’s Club of Seattle on September 24,. 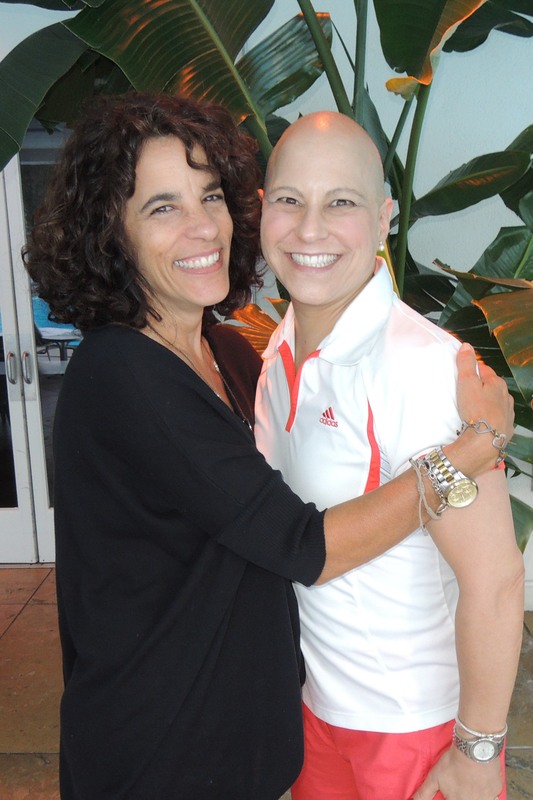 Gilda’s Club is named in honor of Gilda Radner, who, when describing the emotional and social support she received when she had cancer, called for such places of participation, education, hope, and friendship to be made available for people with cancer and their families and friends everywhere. 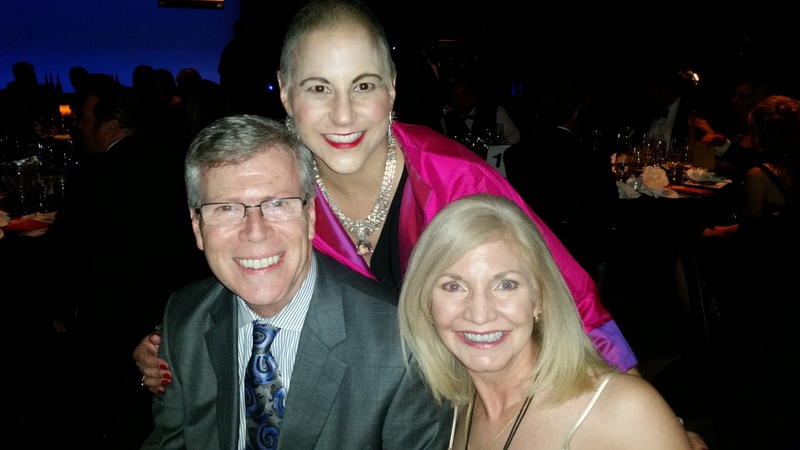 Then, the American Cancer Society (ACS) had a wonderful Gala two weeks after my surgery and I had a great time dancing (gently). I went with Kari Dart and Karin and Paul Allen, too. (No, not THE Paul Allen, but my Paul is just as special!). It was the first time out in public with my hair “fuzz” as I have not enjoyed the growing-out look. F. Sporting events to rally the community. 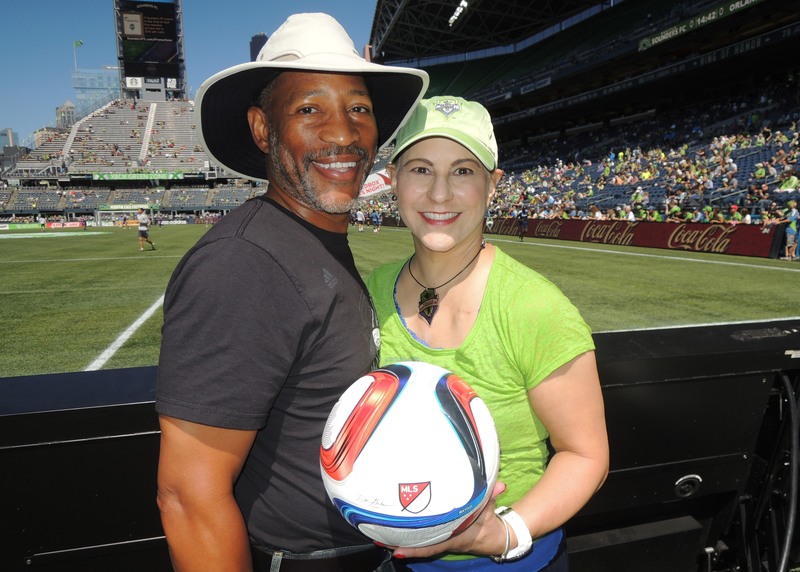 The Virginia Mason Cancer Institute invited me to be their “Patient Hero” for the Seattle Sounders soccer game on August 16. 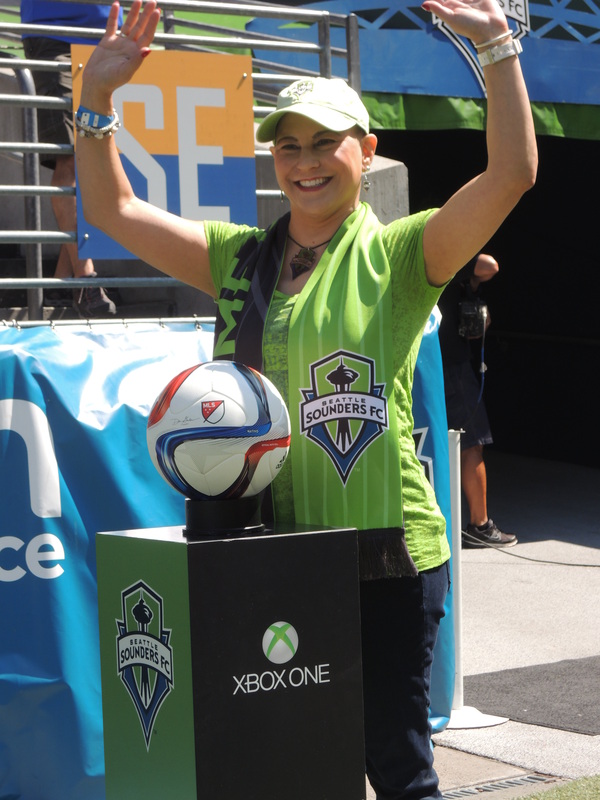 I got to place the match ball on the podium, high five the players, and then the announcer read a short story about Tracy and I.. Mathis and Kari and Sean Dart were there – and the Sounders won! 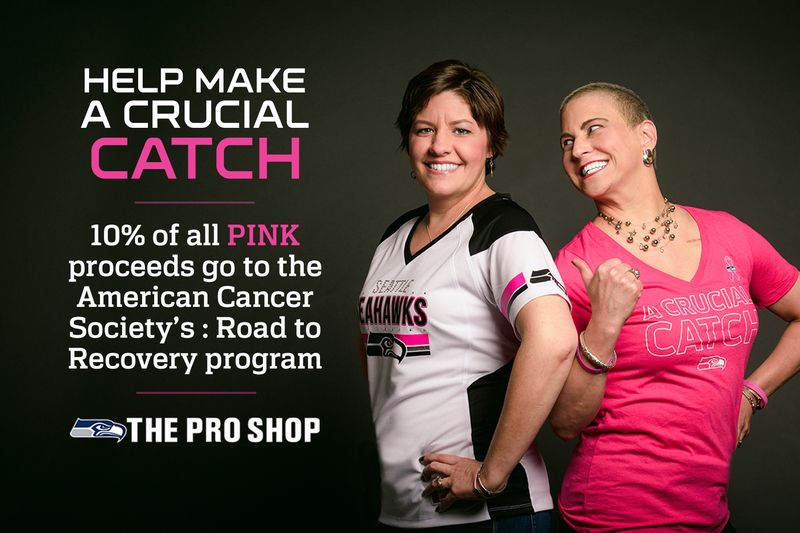 G. Seattle Seahawks model – for new Pink Merchandise for the NFL’s Crucial Catch. Last week, I had a blast pretending I was a model. 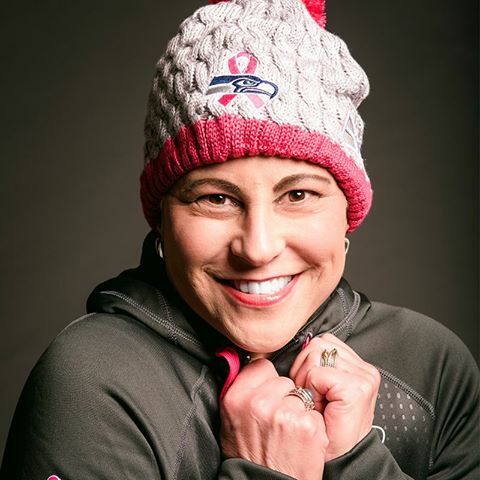 The Seattle Seahawks are launching their new line of PINK Seahawks merchandise and they asked ACS for patient models. Off I went! The campaign is now live and I’ll be in a different shots. You can see them rolling out here. A number of them are used for social media so you’ll see them on Facebook here. 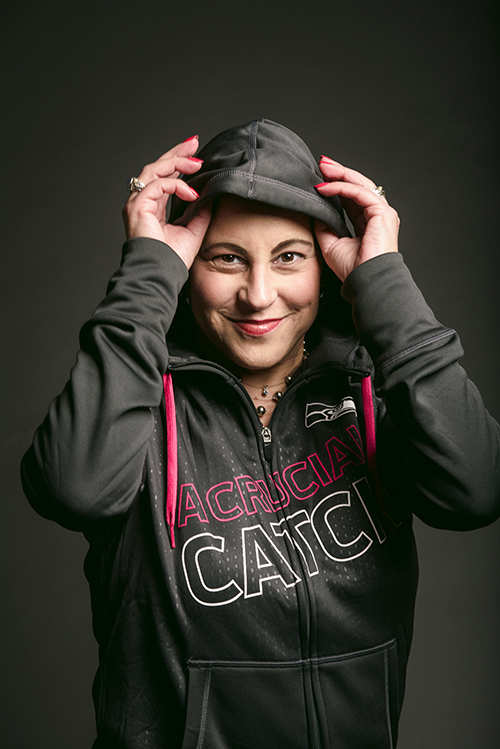 You can read about the NFL’s Crucial Catch Program here: http://www.nfl.com/pink. I know a lot of people question the interest of the sports teams during this month-of-pink. And there are some people who can’t stand the color pink for this cause, either. But the bottom line, to me, is that any incremental amount of dollars toward screening, patient support, or research is a wonderful dollar. So deal with the pink! Better yet, wear it proudly. I am. October 5th Seattle Seahawks Game at home: First, I’ll be interviewed by King 5 at 7am. Then I’ll have radiation at 10:45am, then back to the game to be on the field at half time with other survivors for their “Crucial Catch” game. 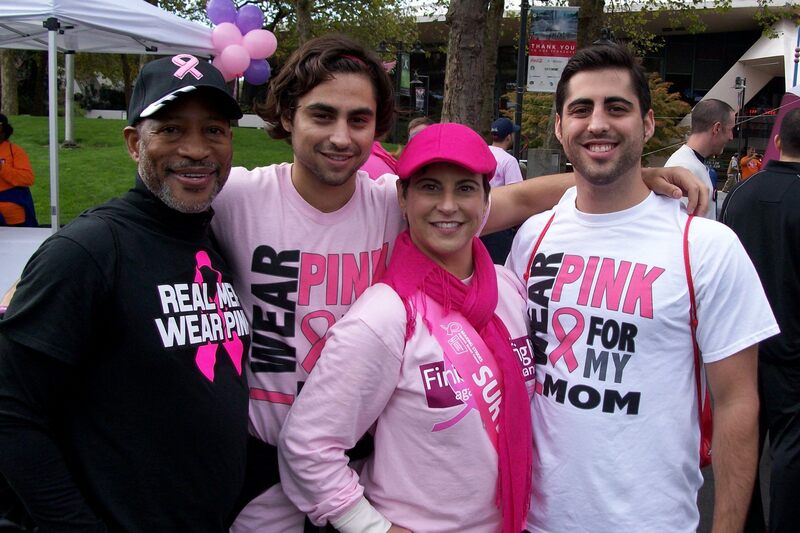 October 10th, Saturday, the big “Making Strides Against Breast Cancer” 5K walk with my family and friends. Join us! Go here to sign up as a participant on “Dana’s Gladiators” team or donate. Chad and Shane were here visiting following Shane’s week of hiking through the Cascade mountains. 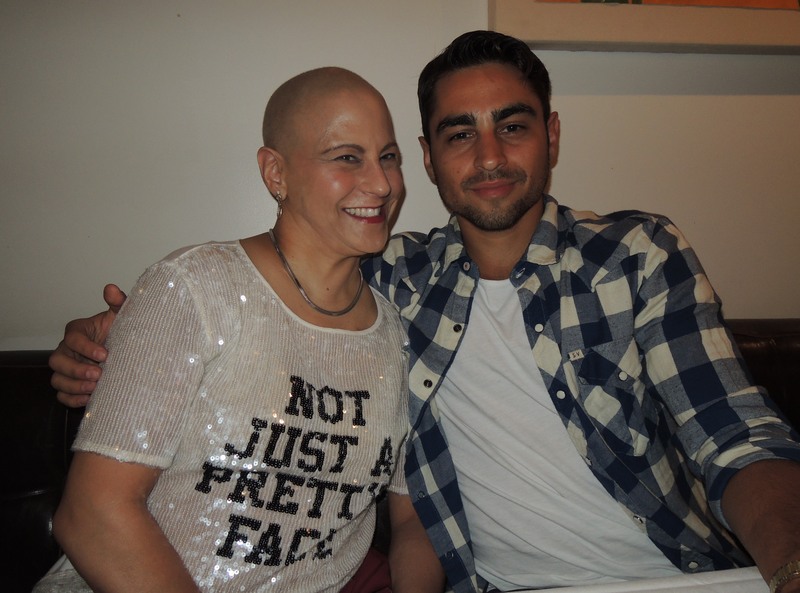 They come back to Seattle 10/9 with Milo and Mom for the big cancer walk, too! I’m planning our wedding celebration for January 2016 and it brings me joy to plan something FABULOUS. Here is a recent photo that our friend, Alison Jensen, a professional photographer, took of us. Mexico ahead! 5 days after radiation finishes, Mathis and I are off to Puerto Vallarta with Ilse (Mom), Shane, Chad, and Milo during Thanksgiving week. January – a wedding party! And I’ll plan more happy milestones after that, of course. Got ideas? All of our kids and family are doing well…we are so blessed. Mathis’ daughters, Christina and Leslie are thriving and Tracy’s son, Milo, is crushing it down in L.A. I would just like to express my warmest gratitude for all of your calls, greeting cards, words of support, and invitations to fun things. I’m asking for your support! As you know, October is Breast Cancer Awareness Month. 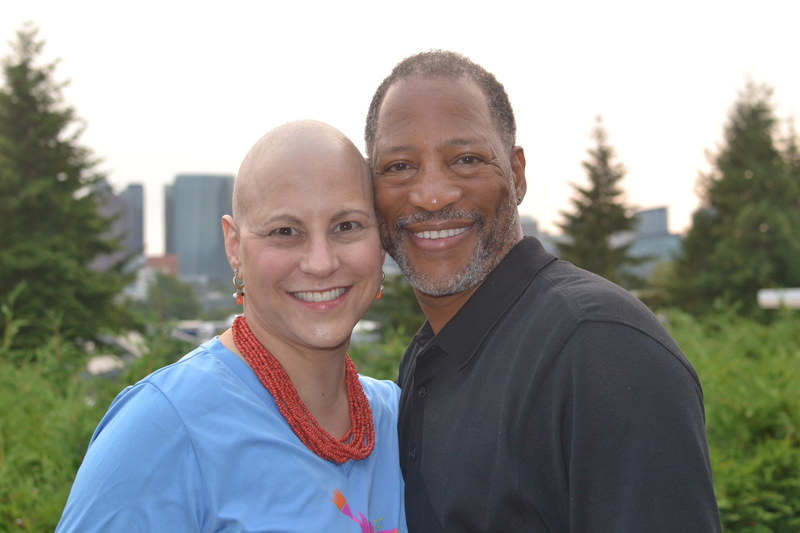 Please join me in my #1 major event to memorialize Tracy, whom we lost a year ago. 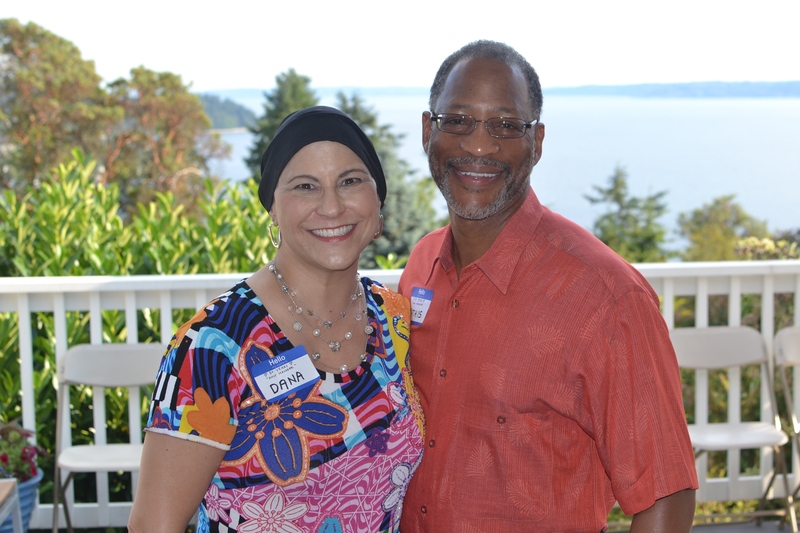 And to be a member of “Dana’s Gladiators” by donating and walking if you are in Seattle on Saturday, October 10th, 8am check-in at the Seattle Center. Simply go here and do your magic: http://main.acsevents.org/goto/Danas_Gladiators. Last year, Mathis, Milo (Tracy’s son), and Chad joined me in our walk. This year, my Mom, Milo, Shane, Chad, and Mathis will be there too! Thank you to all who donated and walked last year; hope you can be with us again this year. New this year, just for fun, the first 50 of “Dana’s Gladiators” get a great T-shirt, sponsored by American Apparel! Click “Participate” and come out and walk! Forward the link to your friends and family to join you. 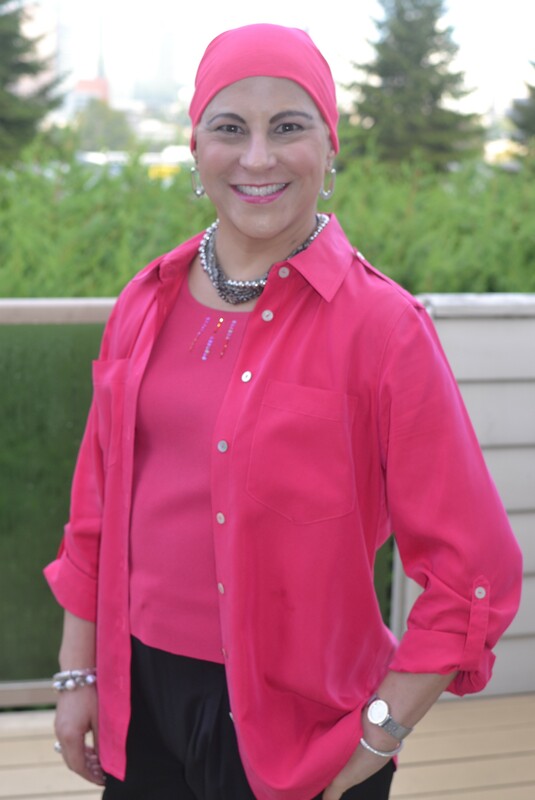 I’m the American Cancer Society’s “Survivor Ambassador” for this year’s event. 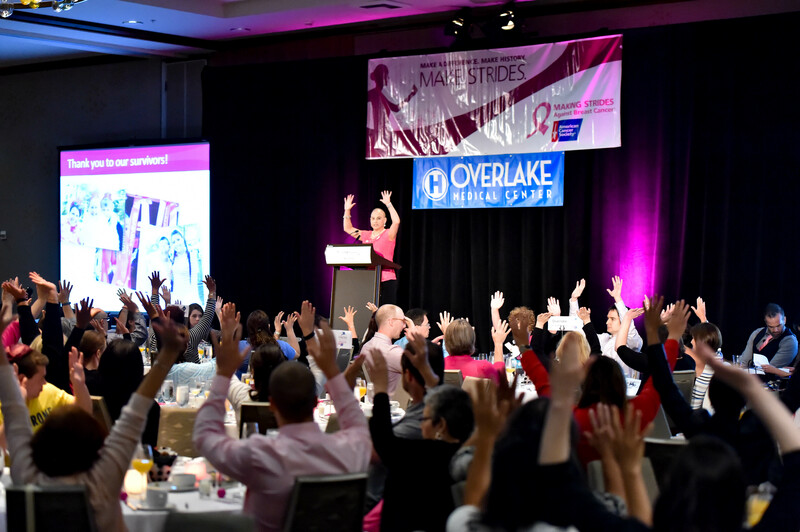 It has been a huge joy and honor to be the American Cancer Society’s “Survivor Ambassador” for their premier event “Making Strides Against Breast Cancer” on October 10. I have spent a lot of time being a strong voice, advocate, and storyteller to the media and co-team leaders and I’ll be speaking at the 5K family walk event, too. Cancer Has No Chance. Zero. Period. 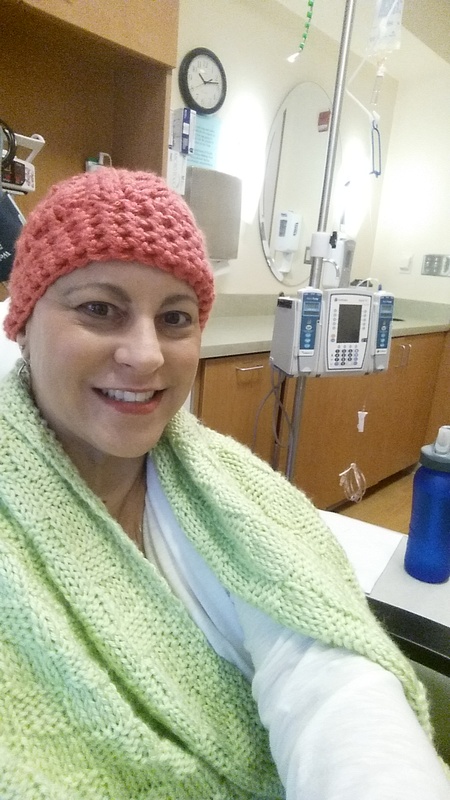 20 weeks of chemo, check! Surgery to remove the entire right breast (2nd mastectomy), check! My medical team at Virginia Mason was fantastic from the 5:45am check-in on the September 3rd until my checkout at noon on the 4th. Mathis stayed overnight on a cot and we’re both glad to be home for a good night’s sleep …and the beginning of my two-week-plus recovery. Oh, and here is what Mathis packed for his overnight stay. Obviously I’m driving him to drink! Look what Mathis snuck into the hospital! Unfortunately – and fortunately – I’ve been through this operation and the recovery process before. I need to take it very easy so I heal faster, which will allow me to head into radiation sooner. 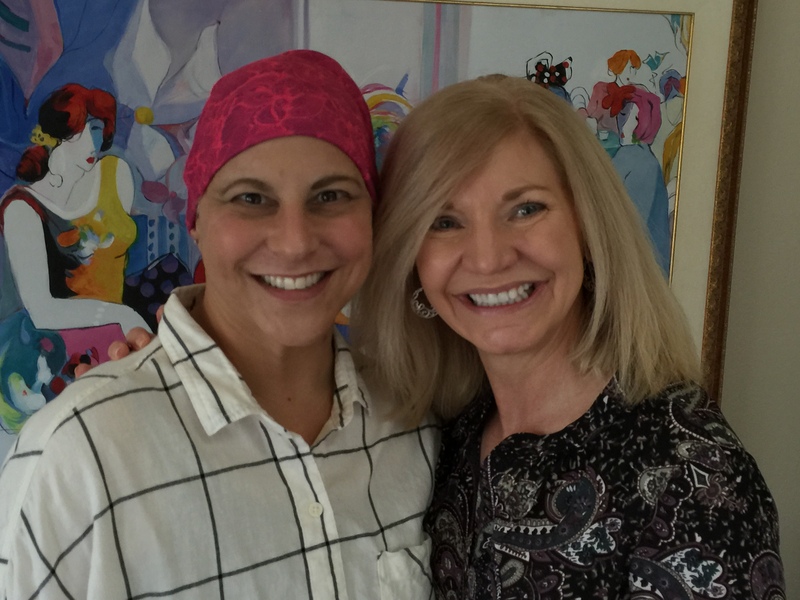 Post-surgery 9/6, sharing a photo with my friend, Karin Allen. She and Paul brought yummy food, flowers and laughter. Next treatment: aggressive radiation. The area will be broad, blanketing all mammary lymph nodes up to the bottom of my neck. I’ll be done by Thanksgiving! Scans again by the end of the year. Then pills to keep the cancer at bay for the rest of my life. 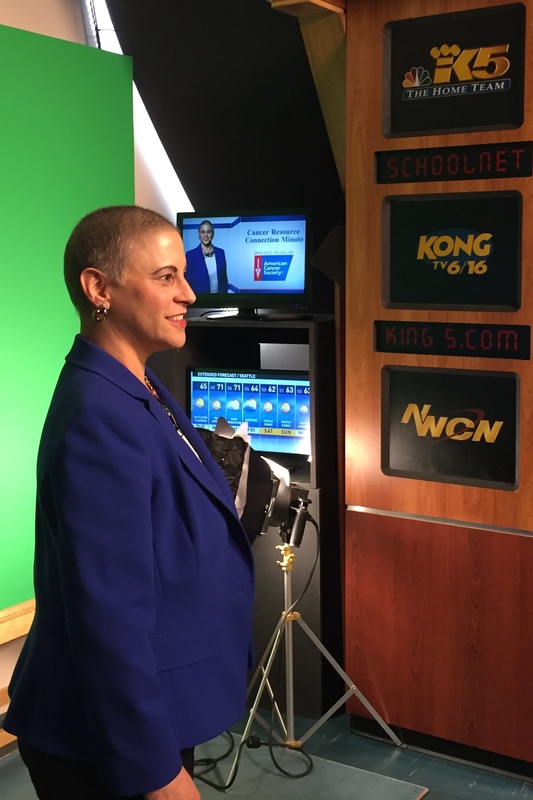 This week, Wednesday, I’ll be interviewed on a local TV show, “New Day Northwest”, along with the American Cancer Society in preparation for the October 10 “Making Strides Against Breast Cancer” 5K family walk. You can sign up now as a participant and help “Dana’s Gladiator’s” reach 50 people walking together. And/or donate any amount. I love having these milestones to look forward to. More importantly, I love my family and friends love and support. Good news! 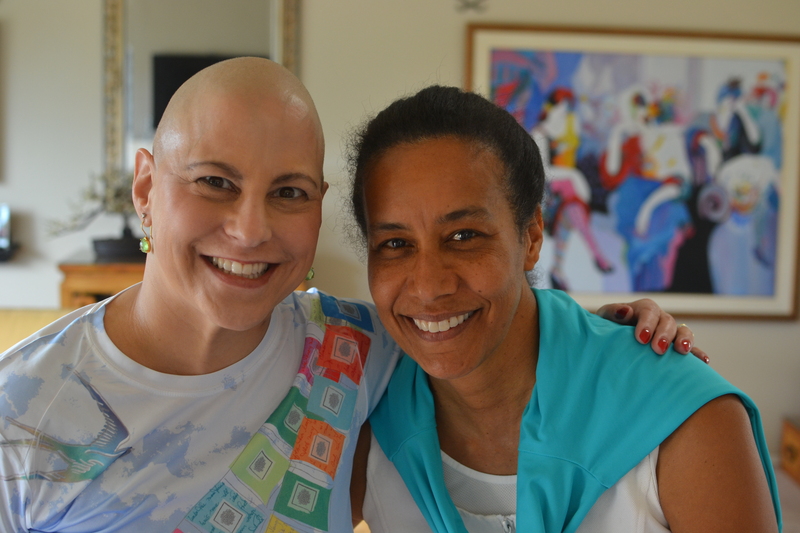 My scans on August 17 showed diminished cancer on the mammary lymph nodes and another area showed no visible cancer. So chemo did most of what it’s supposed to do. 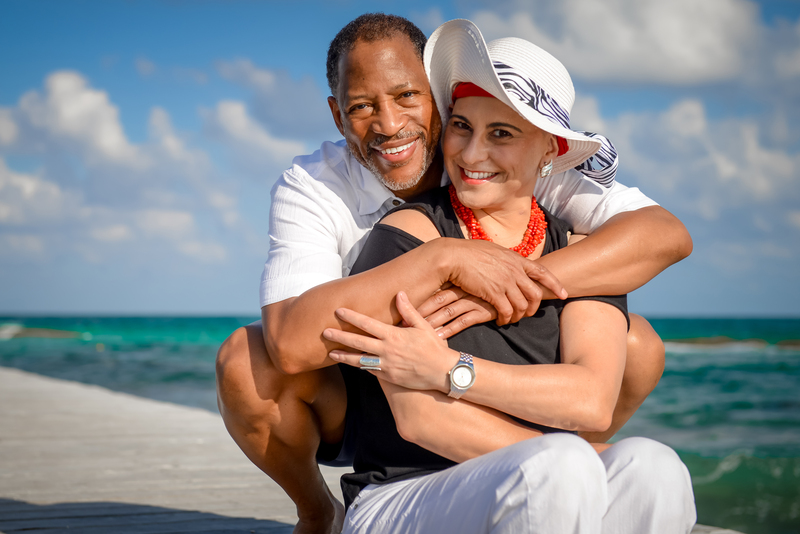 Now, we continue to treat the cancer aggressively! 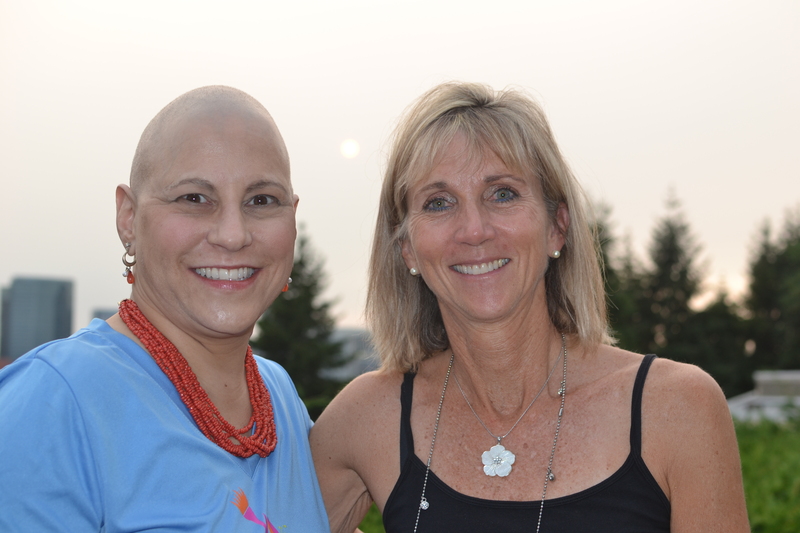 Surgery on Thursday, September 3, which is similar to a mastectomy (again) on the right side. At least a few weeks recovery and lots of Vicodin for pain. Radiation will start as soon as possible after surgery for 6 weeks every single day. Puerto Vallarta during Thanksgiving week! I am feeling much better now as my energy is coming back (along with my hair). I’m back in the gym, although not 100% yet. Getting there! Yes, surgery and radiation will set me back a tiny bit but not too much. I like to plan fun things to look forward to. And when opportunities come along, I take them! 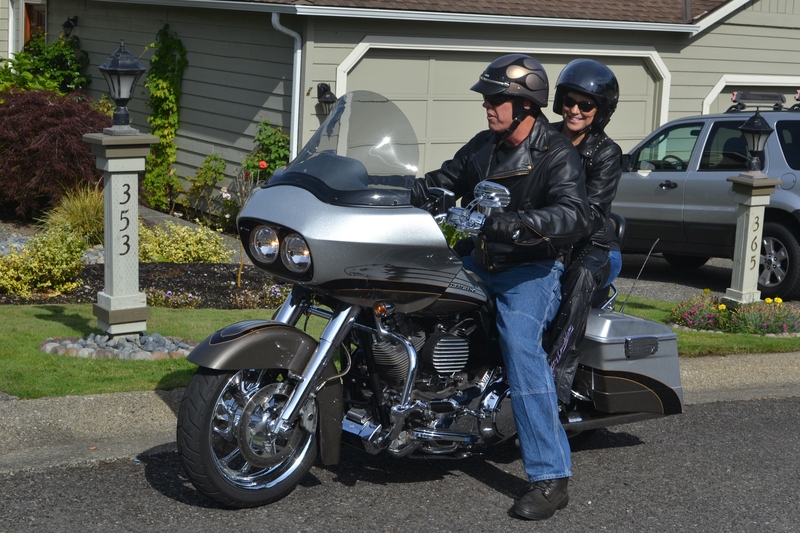 I recently had a great experience; I got to ride on our friend Carl Sittig’s Harley Davidson motorcycle! 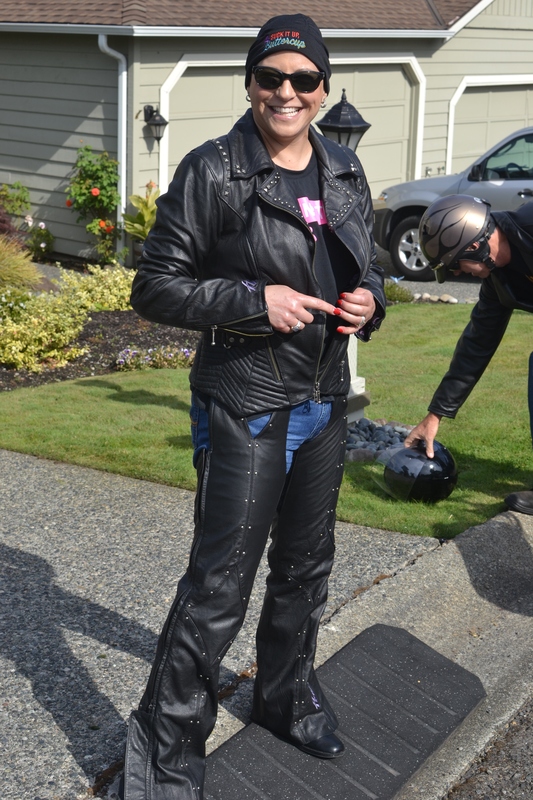 Not only that, but he had the gear so I got to look the part, too! 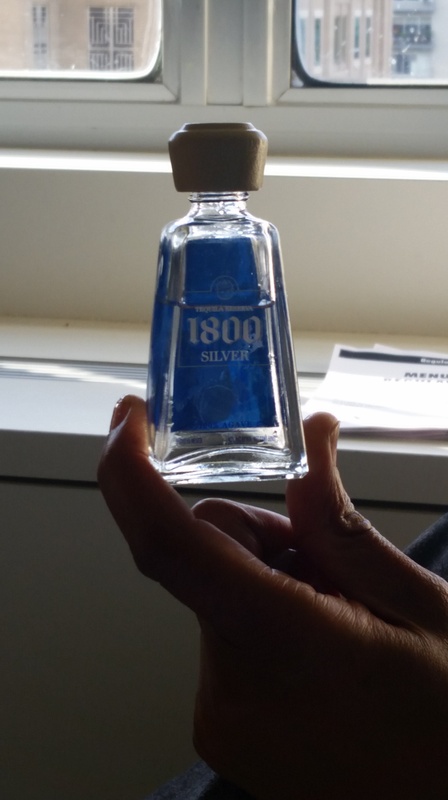 Thank you, Carl, for the special treat! 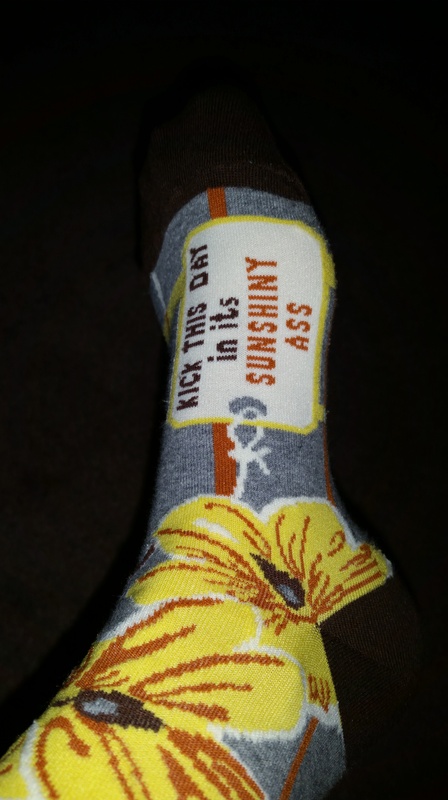 Two of my girlfriends, Gail and Connie, have given me great socks, and I wore them to chemo for every treatment! The nurses loved them, too. 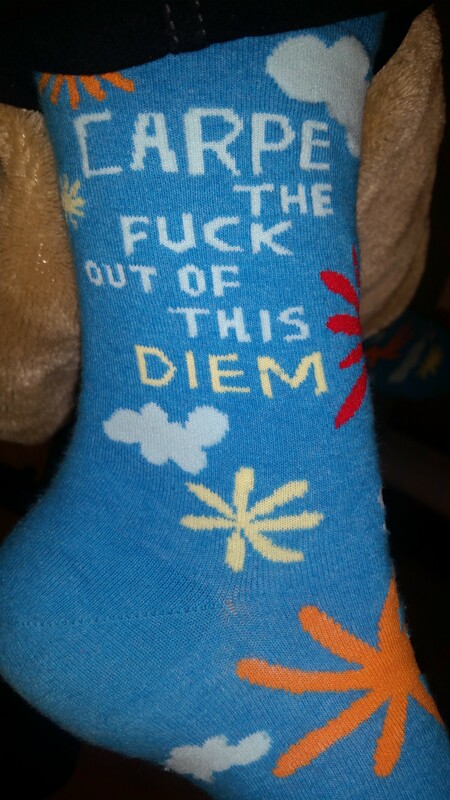 3 mix n’ match socks – fun! 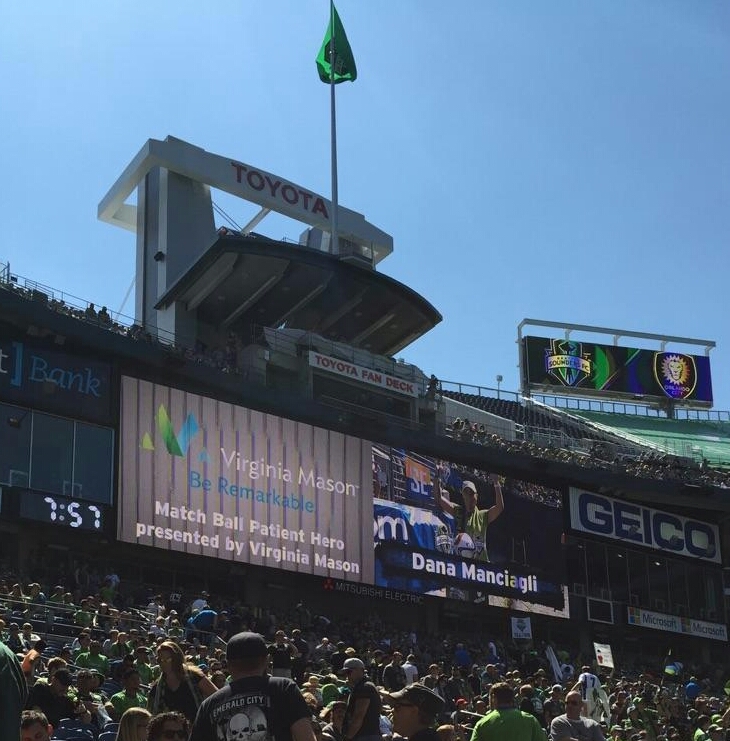 My medical family at the Virginia Mason Cancer Institute invited me to be the “Patient Hero” at a sold-out professional soccer game between the Seattle Sounders and Orlando FC on August 16, 2015. I placed the match ball on a podium to kick off the game, high-fived the players as they came out, and then the announcer told my story to a stadium filled with 40,000 people. They learned about my three rounds battling cancer, about Tracy, and my efforts to raise money for the cancer cause. 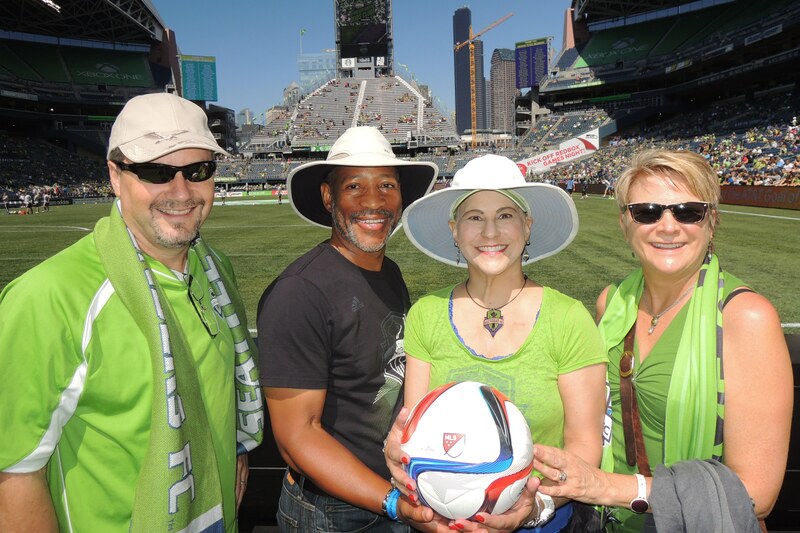 Then we all watched the rest of the game and the Sounders beat Orlando 3-0! 2 Big Screens and an announcer telling my cancer story and honoring Tracy, too. I’ve really enjoyed giving time to the American Cancer Society and the Virginia Mason Cancer Institute to help raise awareness and funds. So, between now and the month of October (Breast Cancer Awareness Month), I’ll be a “survivor ambassador” and do some local TV and radio shows. October 2-3, I get to visit my Aunt Sandy, Uncle Bobby and Cousin Elizabeth and her kids in Durham, North Carolina. Can’t wait! Mathis and I are constantly planning concerts, golf, movies, outings with friends and so much more. Join us! A special thanks to each of you for being on my team, supporting me every step of the way. I still hear “Oh, I don’t want to bother you” or “call me when you need me” but please reach out any time of day or night. If I’m resting or sleeping, my devices are off so there is no risk of bothering me. I cherish each connection with family and friends. I used to be that “crazy-busy” person and now look back and wish I had taken more time (prioritized) to just be there for friends. Family and health were always a top priority, as they are now. You knew that Mathis proposed on my birthday in June, right? 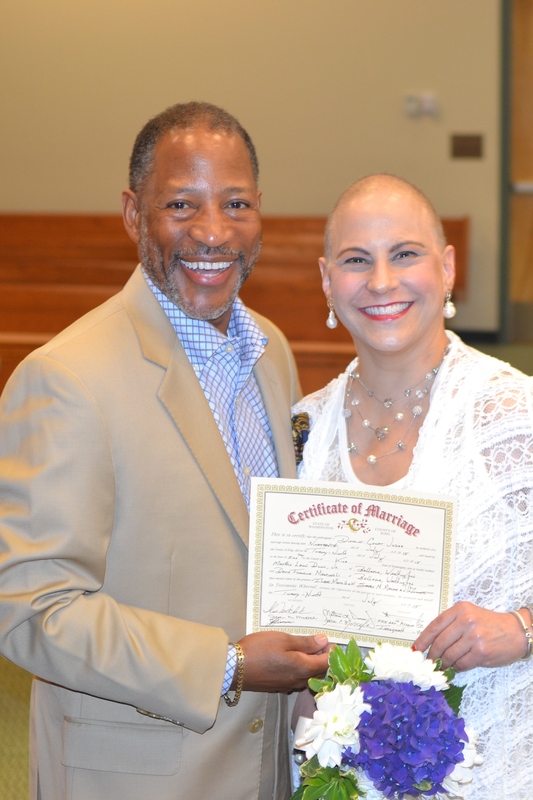 What you didn’t know is that we went to the courthouse and got married on Wednesday, July 29th! So easy and stress-free. My wonderful mother, Ilse, flew up from L.A. and two of Mathis’ buddies, Joe and Steve, were there as witnesses, too. The judge did a beautiful job with the vows. We followed the 5pm ceremony with a dinner at Jak’s Grill in Issaquah and then: done! Marriage Certificate at the Courthouse! ABSOLUTELY, POSITIVELY NO GIFTS (of any kind) !!! 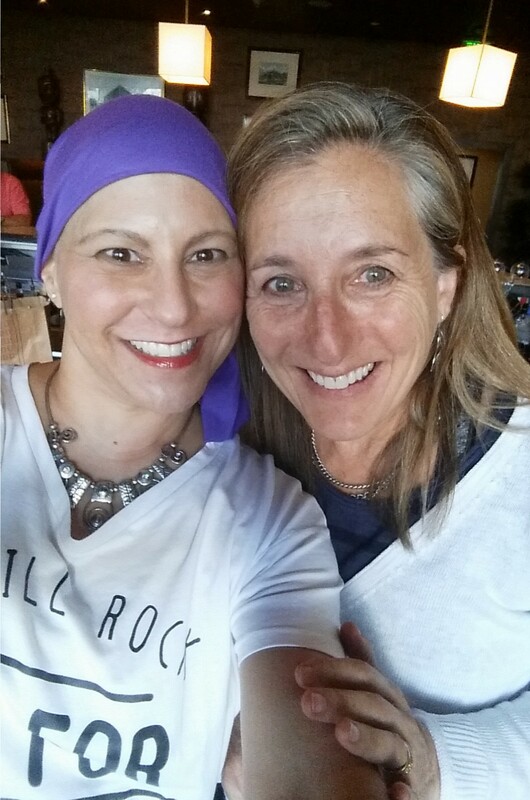 I had my last chemo treatment on Tuesday, August 4, and we celebrated with the nurses and oncologist. Next steps are scans on August 17th, then surgery, and then radiation for 6 weeks. Almost done – I can see the end. I know I crushed this stupid cancer! I can’t thank my friends and family enough for being AMAZING. My family has been by my side every step of the way. 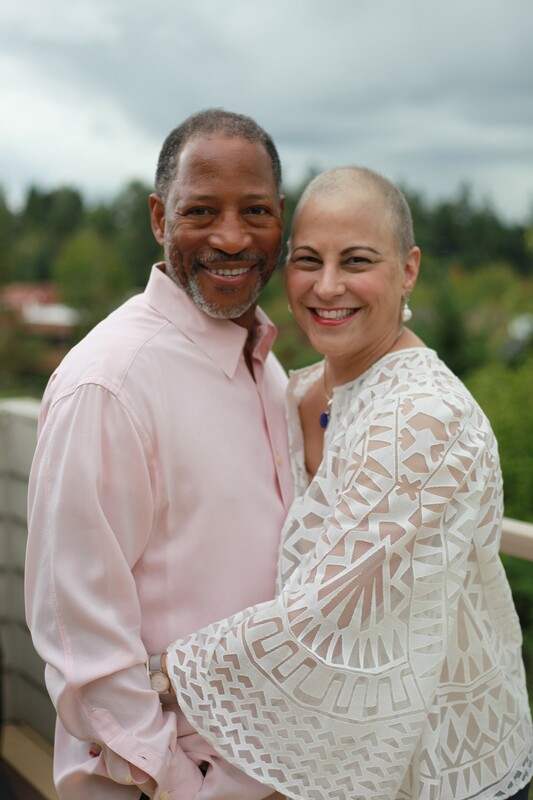 And my wonderful husband, Mathis, has truly been dedicated to my breast cancer battle 24/7; reducing his travel for work, gently scolding me when I’m overdoing it, and holding me when the nighttime blues hit. Thank you, my love. 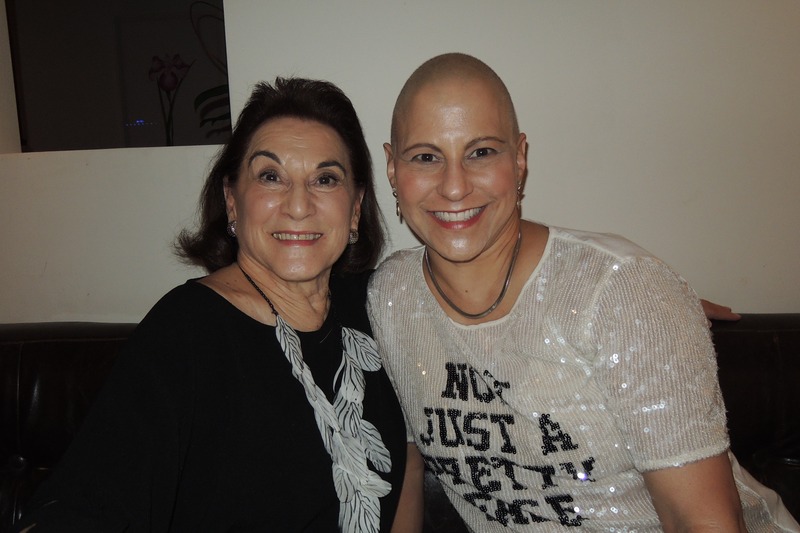 During a recent fun trip to Los Angeles, my Mom, Ilse, and I had a mother-daughter bachelorette party. We started at 3 in the afternoon with facials and massages. Then, we went to dinner with celebratory beverages. Then we saw Magic Mike XXL! Yes, indeed, and loved every minute of it. Then, Evy proceeded to tell me that she thought her mother-in-law was in chemo for her arthritis. I paused again and gently said, “I’ve never heard of this treatment for arthritis. Did your mother-in-law lose her hair, too?” Evy said “No.” Stumped again. We didn’t talk for the next 50 minutes. …what are some you recommend? Reply in Facebook or via this blog with your best answers! I love, love visiting with friends. You give me energy, love and laughter. In the last week, I’ve had two friends fly up to Seattle: Ina from L.A. (a high school buddy), Lindy from San Diego (a college roommate). 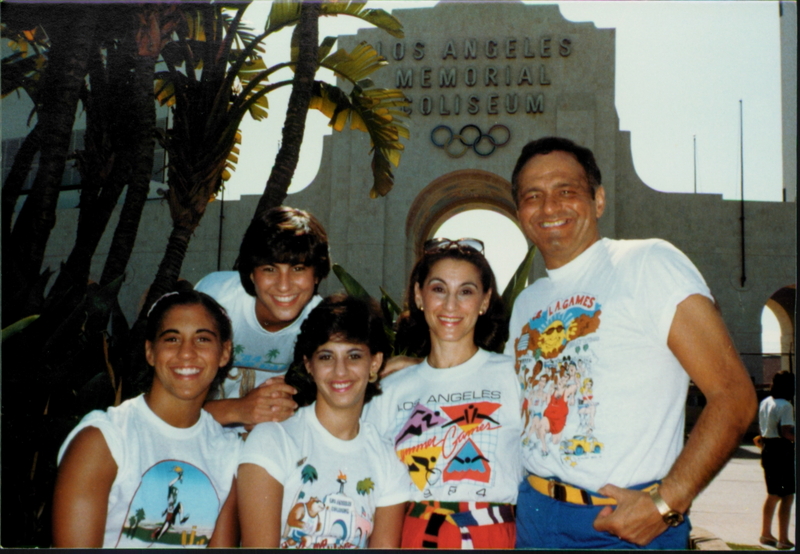 Then, during my short L.A. trip, I not only spent time with Mom and Milo, but I saw Vicki (kindergarten-through-high school), Randy and Alexis (1984, on), and Francine (since 4 years old). 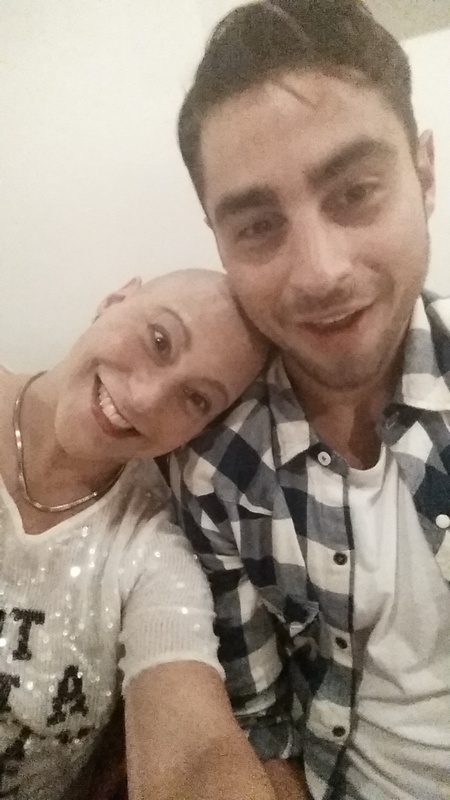 So many of you ask how Milo, Tracy’s son, is doing. He is amazing. He co-manages a hot, Santa Monica bar, the Shore Bar, and helps the parent company with their other restaurant and bar venues, too. He’s learning so much and is able to go to auditions and gigs for commercials during the day. He recently taped a two-day Footlocker commercial. He’s got amazing friends around all the time and he has simply blossomed. (Yes, I’m embarrassing him right now…oh well). He’ll be coming to Puerto Vallarta during Thanksgiving with Chad, Shane, Mathis, Grandma Ilse, and I, too. Joy from being engaged! I’m enjoying planning a wedding celebration in early 2016. Mathis and I will get married at the courthouse on July 29 and Mom will fly up from L.A. to be a witness, along with one or two of Mathis’ friends. It’s all very special. I’ve had some challenges with my low white blood cell count, but my oncologists don’t anticipate any further low counts. Fatigue is increasing and good size headaches pop up. However, overall, I’m doing well. Naps are my best friend, my appetite and taste buds have returned, and I’m getting better at listening to my body and going horizontal when I need to rest. I can’t thank Mathis enough for being all-in every day and night. He has curtailed his travel, is always checking in on me, warning me when I’m over-doing it, and being super sensitive when I get anxious or scared. Shane, Chad, and Milo are also amazing for calling, dropping lines, and visiting. And Mathis’ girls, Christina and Leslie live out of state, but constantly send their warmth. And my mom, of course, is “all in” too! THANK YOU: Everybody near and far has been amazing and please don’t ever think that you’re bothering me. I’ve heard that from a number of folks. Please know that when I’m sleeping, my phone is off. I get energy and joy from visits e-mails, Facebook notes, cards or phone calls. Last Saturday, Mathis and I attended a Junior Achievement fund-raising picnic since I’m still on the board. They sold raffle tickets for a number of cool prizes so we donated to the cause and put little red tickets in each prize bowl. Wouldn’t you know it? 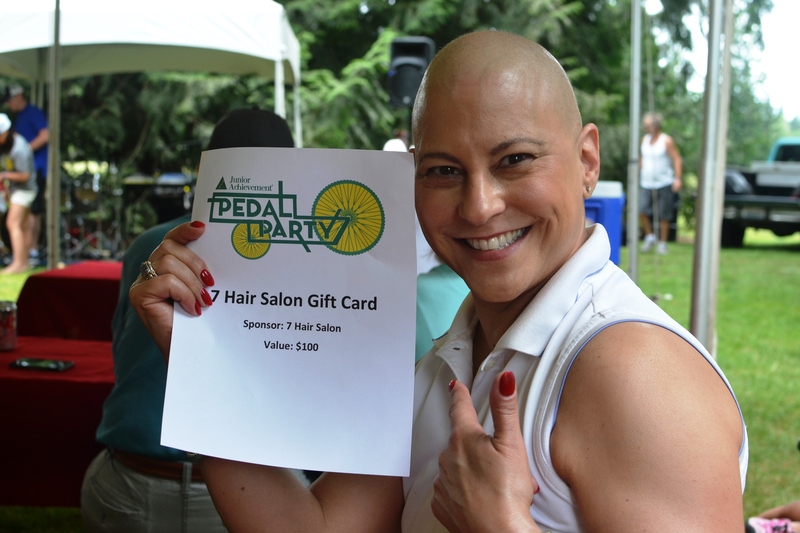 Of ALL the prizes and ALL the event-goers, I won two free haircuts at a local salon! Just what I need, right? But the real dilemma is that the hair on my head doesn’t talk to my eyelashes or eyebrows. Once my head hair started growing back, my eyelashes fully fell out. Then, my eyebrows started peeling away a few weeks later. Can’t you guys get coordinated? Well, I must share our glee with getting married. And since most of you saw the “joke” ring that Mathis bought me, I thought I would show you the real wedding ring that I’m already wearing. Who cares about the order of things, right? 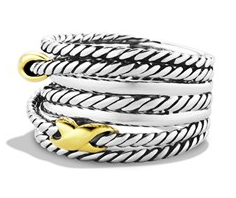 It’s my favorite designer, David Yurman, and so gorgeous. I am doing great. Really. Yes, I’m fatigued, but no serious side effects of chemo. I have 5 weeks left of chemo (August 4) then two weeks to wait for scans, then radiation for 6 weeks. Recently my white blood counts have been very low so I missed one week of chemo and then only got partial chemo the following week. That means my bone marrow is “tired of chemo.” But I just started new shots that I’ll give myself daily to boost them up again through the end of chemo. Radiation is tricky since I’ve had radiation before in 2002, but I have a lot of faith in my amazing Virginia Mason cancer team of doctors. There may be some surgery, too. All depends on those scans so please keep up the happy thoughts and prayers! 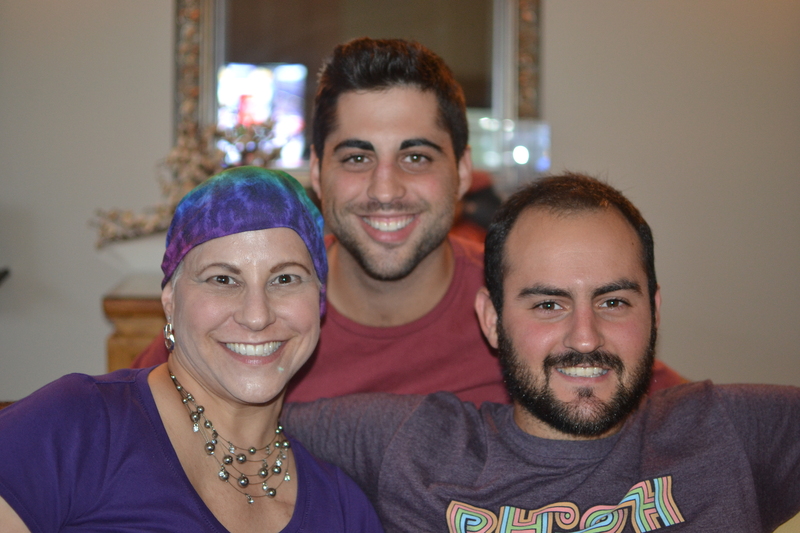 Here’s a shot from Tuesday’s chemo (June 30) and Mathis was sitting there right next to me! Thank you for all of the well-wishes, prayers and happy thoughts streaming in. Please stay close! On June 17, after a wonderful birthday dinner, Mathis asked me to marry him! We’re so thrilled and we’ll continue to enjoy our wonderful life together. Our celebrations will be low key; however, we’re certainly celebrating life every day and wanted to share our joy with you, too. 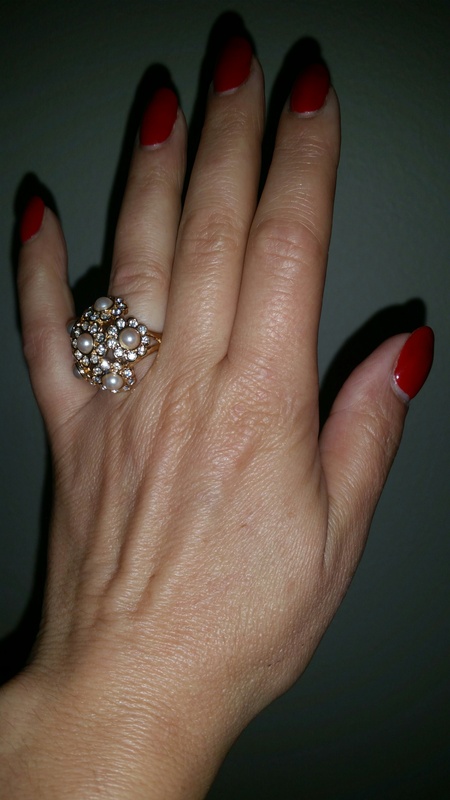 What about the ring, people ask! You all know Mathis is a jokester and would like to be a stand-up comedian in his next life. You also know he knows me quite well (and tolerates my unique characteristics). He knew I would want to select my preferred ring style. So he went to Ross Dress for Less and poured through a stack of cheap, costume rings. He found my engagement ring prize for $7.49 so here is “the rock” I received. It’s a beauty, eh? Hysterical! P.S. Mathis already bought me a gorgeous David Yurman wedding ring. We just want to share our love and appreciation for all of our family and friends. Great news! 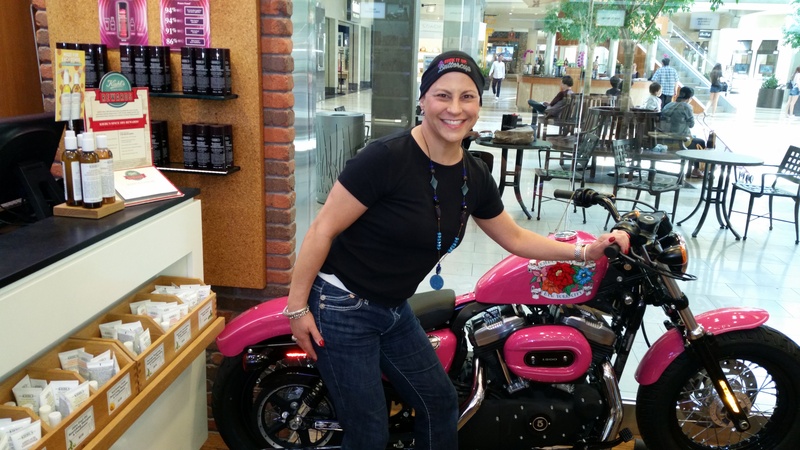 I’m past the half way point in my chemo treatments! I have 10 more weeks to go of weekly chemo sessions. I’ll have scans after that and the doctors will determine what’s next. It could be more treatment and we’ll be aggressive! It’s been quite a roller-coaster ride, but I’m not alone. 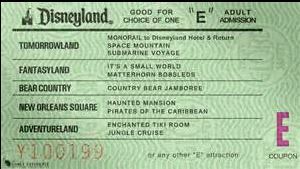 Mathis has been telling friends that he has a front row “E-ticket” – the ones Disneyland reserved for the most exciting rides. We’re definitely on the Space Mountain rails this time! What are my “Cancer Days” like? I am blessed that I have not had the major side effects I was warned about. 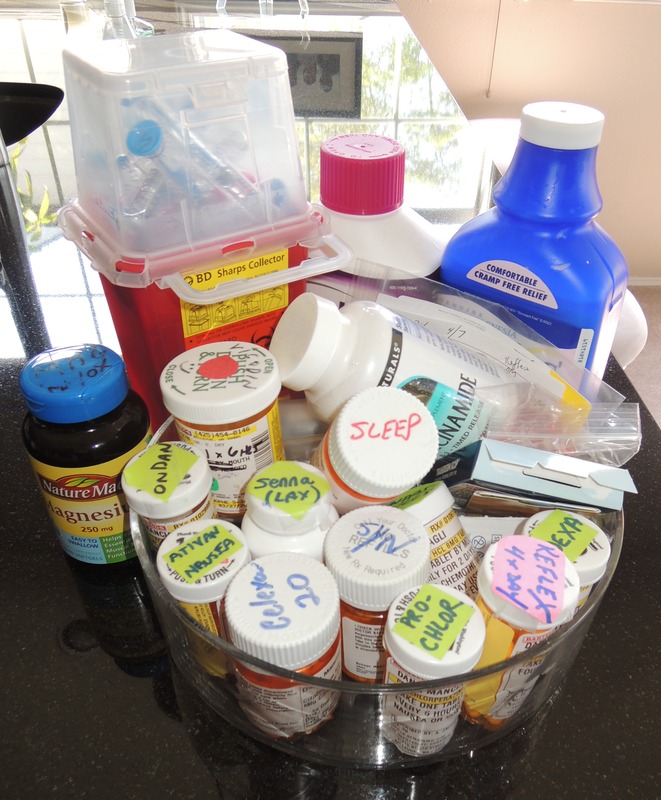 And, I get to stop taking the HUGE stack of chemo-related medicine that went with the first batch of chemo. It was quite a large batch of pills, shots and liquids. 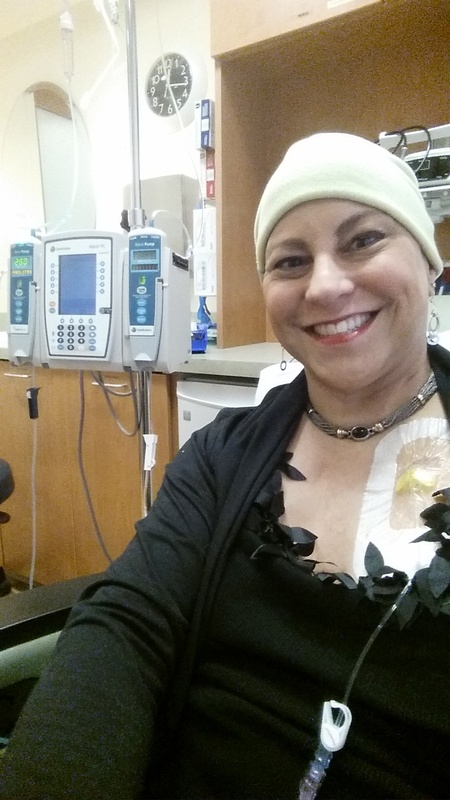 Yes, I’ve been surprised by how tired I get, then I remind myself, “Oh, yeah, it’s chemo.” The doctors say that the fatigue caused by chemo is cumulative so I can anticipate more sleepy days ahead. 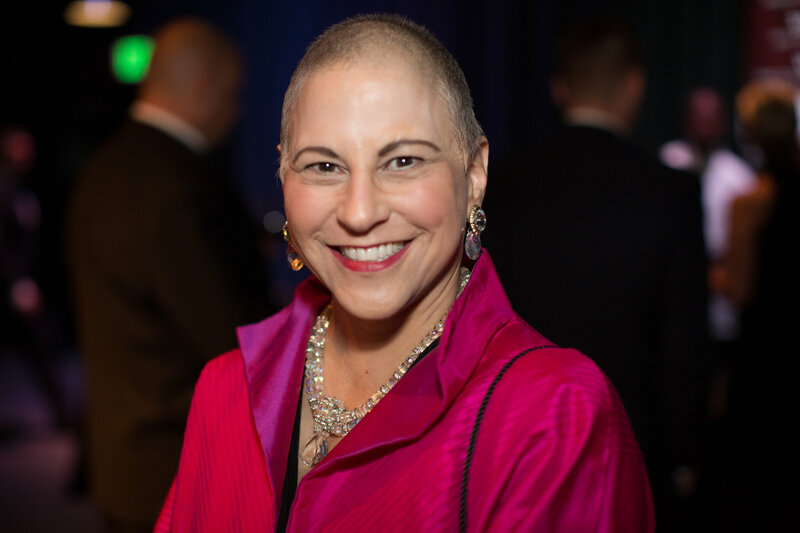 I’ve enjoyed donating my time to two organizations: The American Cancer Society and my hospital, the Virginia Mason Cancer Institute. Recently I recorded a video that was played at a major Virginia Mason fund-raiser for their Cancer Institute; you can watch it here. 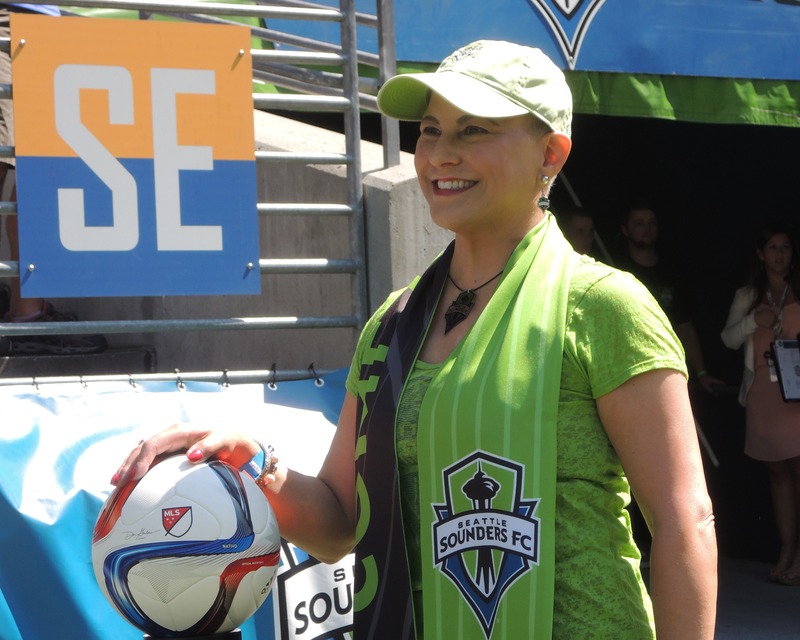 On August 30, I’ll be out in centerfield wearing my favorite bright green and blue as a Virginia Mason “patient hero” at a Seattle Sounders professional soccer game. So look for the bald head! Then, of course, October is Breast Cancer Awareness Month and I’ll host a team for the second time at the wonderful Making Strides Against Breast Cancer walk by the American Cancer Society. Save the date: Saturday, October 10, 2015. Last year was so wonderful and I would love an even bigger team walking together this year! Continuing the theme of what to say or do with cancer patients (see prior blog posts), I have identified a new “family” of gawkers. Yes, those who stare at my bald head. They’re everywhere and I understand it…a bald woman stands out, for sure. The stare-then-smiler. This person stares. Then, when we make eye contact, and they realize they’ve been busted, they smile at me. A classic example is of those boarding an airplane, walking down the aisle, and staring at me. I look up from my seat and they are surprised to make eye contact so they smile! It’s nice. Keep smiling! The long distance gawker. This person stares for long periods of time from a distance. They appear so shocked that they don’t know I see them gawking. Happened at the gym: a person on the other side of the gym, sitting on a weight machine, and doing nothing but staring at me! Great form of exercise, eh? The shocked child. We all know that children speak the truth. Period. So they point and ask questions. Recently a mother was walking her 4-year old daughter around our neighborhood. The daughter stopped, pointed at me, and asked her mom, “Why doesn’t she have any hair?” Her mom just looked at me imploring me to answer her. Mathis was with me and I totally fumbled the answer. 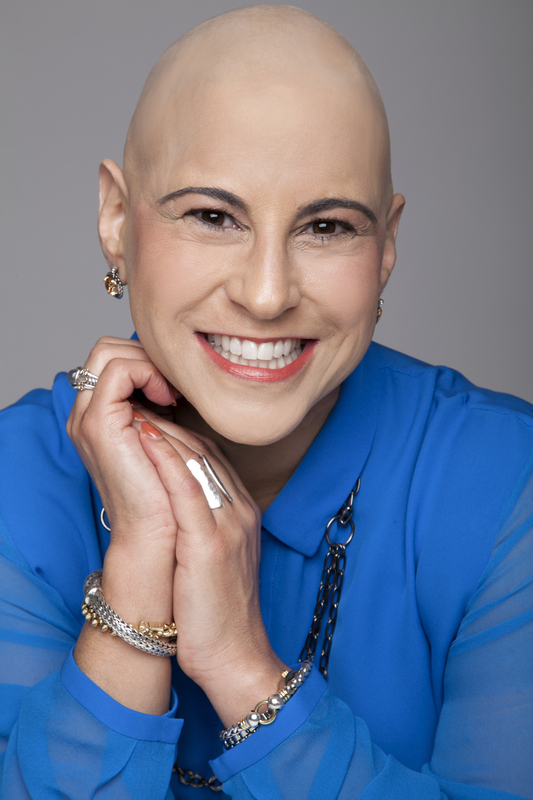 I said, “I lost my hair with a medical treatment.” Yeah, right. As if she would understand that. Since then I am still stumped as to what to tell a child or her mom. What would you say? Please reply with your recommendation in Facebook or on my blog. 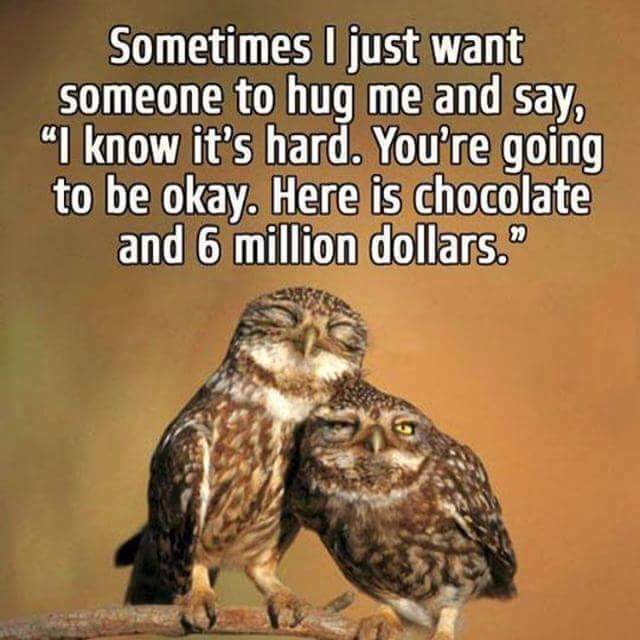 so could you please just send me cash, vodka, chocolates, wine or airline tickets instead? I can’t express enough gratitude for everybody’s incredible support and positive energy. I thought, by now, it would get “quiet.” But, no, the visits, cards, phone calls, e-mails, Facebook comments, texts, and more, just keep flowing in from near and far. I assure you that every touch makes a huge difference. 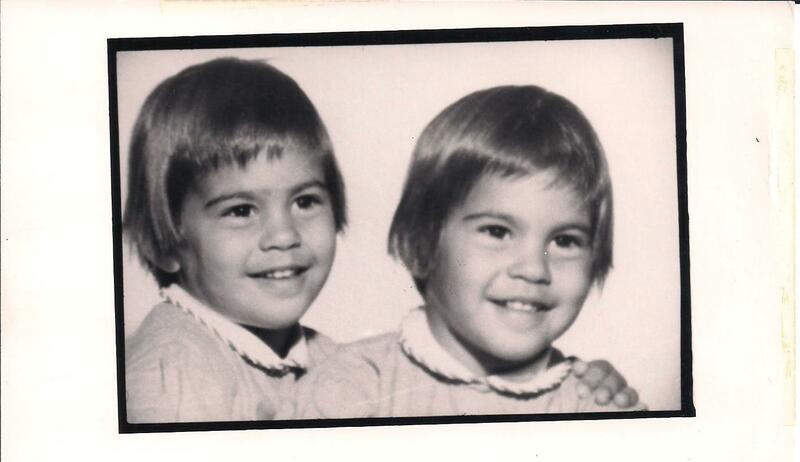 Join our family today to remember the great times we had with my dear twin sister, Tracy Frank. I’m torn between thinking that one year ago was yesterday, or many moons ago. It’s an odd feeling. For me, Tracy’s right here on my right shoulder every day, talking to me. Laughing, boasting about Milo, concerned for everybody’s health and well-being, and coaching me through my own cancer-crushing challenges. She doesn’t want us to grieve for her, yet to remember her legacy. 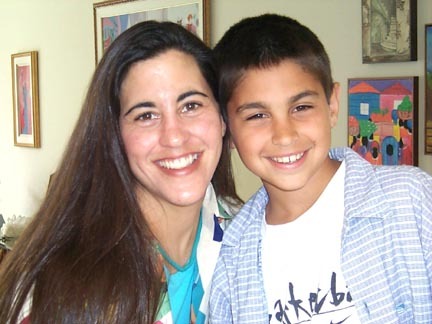 How she truly changed lives for the Parkinson’s disease clients she helped; how she raised a remarkable young man, Milo; how she was always helping our family before helping herself; and how she cherished her friends. 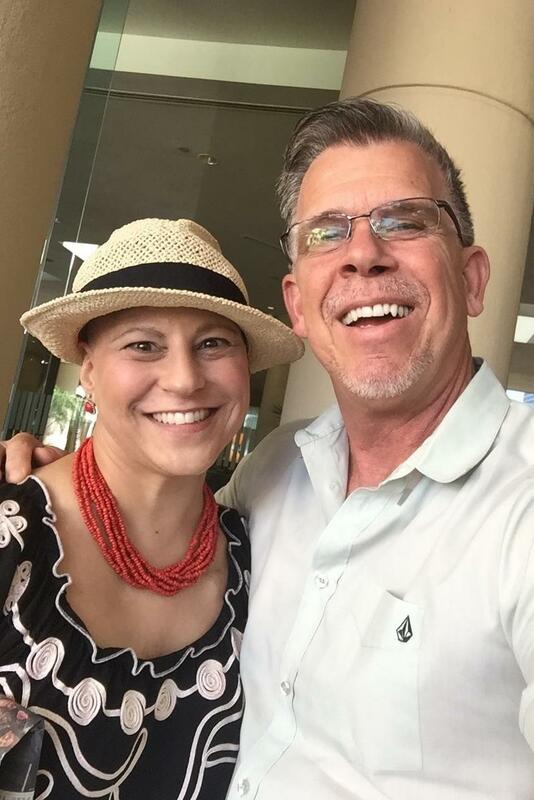 On this anniversary of Tracy’s passing, I believe she would want us to pause and remember some of her favorite recommendations: complain less, count your blessings every day, don’t take your health for granted, avoid the “shoulds,” and do what you believe is the right thing to do. Today, our family remembers and appreciates the huge outpouring of love and support we all received a year ago.